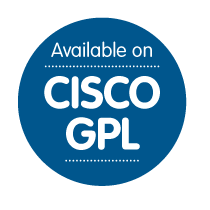 All your favourite Imagicle apps can be ordered via Cisco GPL through the Solutions Plus program! We’re really proud to announce that Cisco has selected 7 Imagicle Apps as its official UC apps solutions worldwide, expanding its portfolio by introducing Imagicle Attendant Console with Advanced ACD-IVR, Hospitality Pack in addition to Call Accounting & Billing, Advanced Directory Services and Fax Server already available on Cisco GPL S+ since February 2012. No matter how big your company is, the solutions now available perfectly fit your needs, either you are a family business or a large enterprise. We’re really proud to announce that Cisco has selected 5 Imagicle Apps as its official UC apps solutions worldwide, expanding its portfolio by introducing Imagicle Attendant Console with Advanced Queueing and Auto Attendant, Hospitality Pack in addition to Call Accounting & Billing, Advanced Directory Services and Fax Server already available on Cisco GPL S+ since February 2012. One Suite, One VM, One integration for all your UC projects. 5 Imagicle apps available on Cisco GPL - SolutionsPlus. Learn More about the Imagicle Application Suite for Cisco UC. order directly through your Cisco Partner. You can buy a single product, and add the others later or take advantage of our special bundles. For your convenience, we've prepared special bundles including three essential apps (Call accounting & billing, IP fax server and Advances Directories & Caller ID) for your business, sized to fit your needs at a very special price. All the SKUs listed in the following sections are available via electronic delivery and you will receive a single entitlement code for each SKU ordered, that can be easily activated here. The software, a single package for all apps, is available for immediate download, ready for activation or for a 30-day trial period. If you buy and activate one app only (i.e. billing), you can evaluate the other apps (Fax and Directory) free of charge, for 30 days, then purchase them later. Simply activate the new apps purchased before the end of the trial period to keep the services. Basic licenses are available for customers with up to 1,000 users, so you only buy one SKU. For larger projects, multiple SKUs will be necessary. Support & Software Maintenance is included! Each SKU includes 12 months of support and software maintenance through our ImagicleCare Basic program. You don't need to buy anything else. If you require longer coverage or advanced support services including better SLA and major release upgrade, request a quote here. Please specify the SKUs for which you require advanced support. Imagicle Blue's Attendant - Attendant Console with advanced Queueing and Auto Attendant. Enterprise, the ultimate Attendant Console, features rich, ideal for operators and supervisors that need special services not included in the Professional version, as: Login / Logout on specific queues, Queued call list and VIP calls, Camp On park, High Availability, Supervisor. Furthermore, an optional license to upgrade an operator client from Professional to Enterprise is available. Imagicle Blue's Attendant Console Professional - 1 CAL exp. Imagicle Blue's Attendant Console Enterprise - 1 CAL exp. Imagicle Queue Manager Enterprise - 10 chan. exp. Imagicle Blue's Attendant Console Prof. To Ent. - 1 CAL upg. Imagicle Queue Manager Enterprise - 10 chan. exp. red. Imagicle Queue Manager Enterprise - auto-attendant module red. Imagicle Hotel Pack - Hospitality services. The Hotel Pack is licensed per server, per number of supported extensions, regardless the number of sites. The Imagicle Hotel Pack is certified with Oracle Hospitality OPERA Property Management, OPERA Cloud Services and Suite8. In order to work with Imagicle Hotel Pack, Oracle requires to buy a dedicated interface (part number 5001-345).Moreover, the Imagicle Hotel Pack is compatible with hundreds of other PMS's (check here the supported PMS’s). The PMS integration interface must be enabled at PMS to allow the connection with the Imagicle Hotel Pack and have the hotel services provided to the Cisco phones. The PMS configuration is required by the partner taking care of the PMS and the additional fees are possible. Imagicle Billy Blue's 4 - Call Accounting & Billing. and type (CUCM or BE6K-7K) of sites. Imagicle StoneFax - IP Fax Server. regardless of the number and type (CUCM or BE6K-7K) of sites. Imagicle Speedy Enterprise - Directory & Caller ID. Imagicle ApplicationSuite for Solution Plus - Bundles. This special bundle lets you buy Call accounting & billing, IP fax server and Advances Directories & Caller ID with a single PID at a very special price. All of the products can be expanded to better suit your needs using the expansion licenses listed in each product's table, i.e. adding more StoneFax channels if the ones included in the bundle are insufficient. Partners can find Imagicle apps in the Cisco tools they are familiar with, like CCW and Quick Pricing Tool. They can purchase them, applying their standard Collaboration discount. Imagicle is one of the dozens worldwide Cisco Preferred Solution Partner and Cisco Ecosystem Partner. All Imagicle Apps are available on Cisco Marketplace for your convenience. Where do I get the Activation code to activate my product? 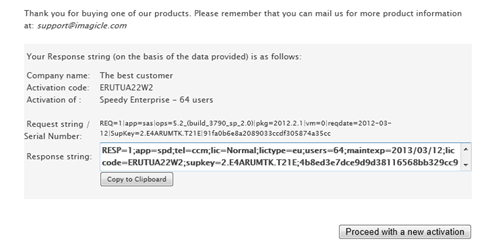 You receive the activation code to activate your product/bundle/upgrade from your Cisco/Partner. Please print and store the activation code in a safe place as it contains important information. How do I activate my Imagicle product? To install Imagicle ApplicationSuite on a server. This is because the activation code will be linked to the specific real or virtual hardware on which the software has been installed. Review the info provided and confirm activation. The system returns a Response String on the web interface and by e-mail to both addresses (customer and reseller). Copy the Response String/Unlock code provided and paste into the activation tool of your Imagicle Application Suite (License-Main web link). See the How to insert the response/unlock codes section for details. The bundle lets you buy all the apps with a single PID at a very special price. You will receive a single Activation code for all of the apps included in the bundle. Before entering your customer info, the process will show you the apps included. Click the Activate button for the first app, insert your customer info and complete the process as explained above. At the end of the process, click on "Proceed with the new activation". Repeat the process for each app you want to activate (customer info will be pre-entered after the first activation). 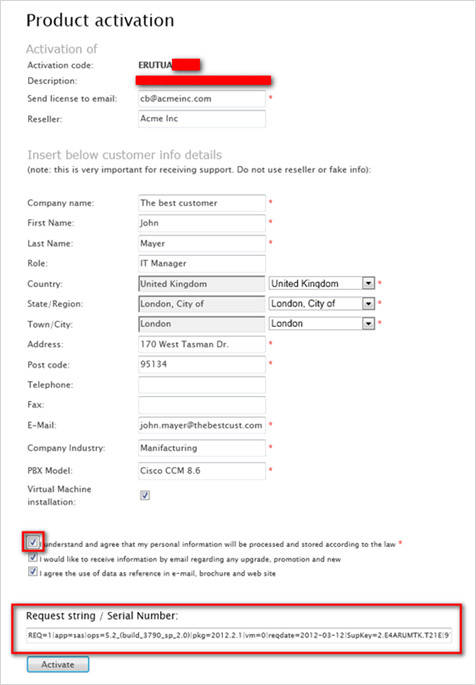 Copy the Response String provided for each application and paste it in the appropriate field in the activation tool of the installed Solutions plus Application Suite, as shown above for single product activation. In this case, you will receive a number of Activation codes based on the total of basic license plus all the expansion licenses purchased to reach the number of extensions/users/channels needed. First activate the basic license, then the expansion licenses. See the "Activating multiple activation codes" FAQ for more details. In this case, you will receive a single Activation codes to upgrade active license to another one. The Optional Module doesn't have to be activated. You activate only the corresponding basic license. In this case, you will receive a number of Activation codes based on the total of basic license plus the redudancy license purchased to get the high availability. First activate the basic license, then the redundancy licenses. How do I activate multiple activation codes? Read the single product activation description for basic activation concepts. The following examples describe possible scenarios where multiple activation codes have to be activated. You purchased a Billy Blue’s 4 1,000 extension basic license + an expansion to 1,000 extensions (product names L-IM110-1000L and L-IM110-1000E). You first need to activate the basic license (activation code L-IM110-1000L in our example) as per the procedure in the “How to activate your Imagicle product”, then activate the expansion in the same way. Activate the expansion license (activation code L-IM110-1000E in our example). You will need to provide the basic license, i.e. the license to be expanded (L-IM110-1000L in our example). Having done that, insert the last Response string you received into the activation page of the installed Solutions Plus application suite software and check that Billy Blue’s 4 has been activated for 120 extensions. You purchased a StoneFax 8 channels basic license + an expansion to 20 channels + an expansion to 30 channels (product names L-IM120-8L and L-IM120-20EC and L-IM120-30E). You first need to activate the basic license (activation code L-IM120-8L) as per the procedure in the “How to activate your Imagicle product”, then activate the expansion in the same way. Activate the expansion license (activation code L-IM120-20EC in our example). You will need to provide the basic license, i.e. the license to be expanded (L-IM120-8L in our example). Activate the expansion license (activation code L-IM120-30E in our example), you will need to provide the basic license, i.e. the license to be expanded (activation code L-IM120-20EC in our example). Having done that, insert the last Response string you received into the activation page of the installed Solutions Plus application suite software and ensure StoneFax is activated for 30 channels. You purchased a 1,000 users bundle Imagicle S+ Pack 1000 – billing 1000 + fax 20 + dir. 1,000 + a StoneFax expansion to 30 channels (product names L-IM990-1000L and L-IM120-30E). You first need to activate the basic bundle license (activation code L-IM990-1000L) as per the procedure in the “How to activate your Imagicle product” section. Then activate the expansion license (activation code L-IM120-30E in our example), where you will need to provide the basic license, i.e. the StoneFax license to be expanded (activation code L-IM990-1000L in our example). The request string is what you get on the installed Solutions plus Application Suite Software. To insert the response string, log in to the Solutions Plus Application Suite web interface as administrator (e.g. http://server_ip_address), insert the RESPONSE STRING in the text box of the application to activate and press Save. 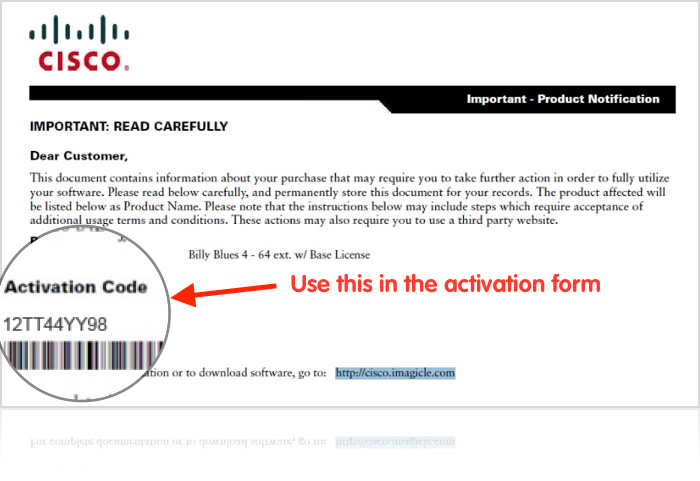 You will receive the Activation code from your Cisco/Partner after you purchase a software product. Please print and store the activation code in a safe place as it contains important information. After activation, the activation code is stored on the PC/Server running the activated application, so you can obtain the activation code through the following procedures.